Better-than-expected reports on retail sales and consumer sentiment lifted big blue chip stocks Friday, but gains were limited by weakness in technology and the strength of the U.S. dollar. 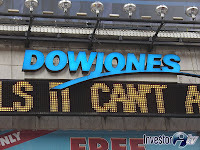 The Dow Jones industrial average (INDU) rose 66 points, or 0.6%, to finish at its highest level of 2009. The S&P 500 index (SPX) gained 4 points, or 0.4%. The Nasdaq composite (COMP) ended little changed. The Dow and the S&P ended the week higher, but the Nasdaq slipped. Big consumer stocks Coca-Cola (KO, Fortune 500), McDonald's (MCD, Fortune 500) and Walt Disney (DIS, Fortune 500) were among the Dow's gainers. Conglomerates General Electric (GM, Fortune 500) and 3M (MMM, Fortune 500) also gained, reflecting some economic optimism. "The retail sales look good today and that's helping, but there could be a report next week that doesn't look as good," said Bernard McGinn, CEO at McGinn Investment Management. "People are reading into the market whatever they want to at the moment, because they're basically done for the year." Trading volume has been light so far this month and trading more volatile as investors close the books early on a tumultuous year. As of Friday's close, the S&P 500 has gained 64% since closing at a 12-year low on March 9. Stocks jumped across the board Thursday as investors sorted through reports on jobs, housing, net worth and the deficit. But investors worked to sustain that advance Friday amid a deluge of information. Additionally, the major stock indexes are bumping up against multi-month highs, with the Dow flirting with a fresh 14-month high, as of Friday afternoon, and the S&P 500 and Nasdaq sitting just below those same levels.